Summary : I was really looking forward to this tea...as I adore caramel. But alas, I found the flavor of the caramel to be very weak, indeed...almost non-existent, despite a 8+ minute brewing time. Review : I'm cursed in life with a sweet tooth. Unfortunately, I'm cursed with a "system" that really doesn't let me eat that much. Of course, this is good in a way...it keeps me nice and skinny. But still, this sweet tooth of mine keeps me hunting high and low for anything out of the ordinary that might satisfy. And wouldn't you know it, during my last order from the Dragonwater Tea Company (now out of business) I came across a tea that seemed like it should do the trick, a Rooibos Tea called Creamy Caramel. Since caramel is nothing but pure sugar that has gone through a process called "caramelization," I thought...sweet tooth satisfied! This roobios tea contains the following ingredients : "Rooibos with caramel bits and safflower blossoms for a creamy-caramel taste." Note, this tea does contain dairy products, just for those of you out there who can't stomach any sort of dairy product in your system. I began to have doubts about this tea the second I opened up the bag. The tea smelled EXACTLY like a straight rooibos tea. Of course, if this was a straight rooibos tea, that would be a good thing. But it wans't. This tea is a flavored rooibos tea with caramel pieces in it, so the lack of aroma had me worried immediately. And adding boiling water to it didn't help the cause. Normally, teas that have little fragrance "out of the bag" release a fragrance the second you add boiling water to it. But not tonight. Instead, once I added the boiling water, the tea had a fragrance of, you guessed it, a straight rooibos tea. Still, I love the teas from the Dragonwater Tea Company, so I kept my hopes up during the 8 minute brewing time. But sadly, the flavor of this tea was pretty much what I expected, that of a straight rooibos tea. Indeed, I could not find anywhere in this tea the true, or even semi-true, flavor of caramel. This tea, to put it bluntly, tastes exactly like a straight rooibos tea. Now, I liked that tea. But, I didn't want to find THAT tea in this one. Hence, I was disappointed. After all, if I wanted a straight rooibos tea, I would simply have one. Instead, I wanted caramel and all I got was this straight rooibos tea with the flavor of caramel conspiciously absent. Recommendation : No. This tea doesn't taste bad or anything. Nor is there anything "wild" about the teas flavor. Instead, this tea is listed as being a "creamy caramel" tea. And sadly, neither the "creamy" nor the "caramel" were found in this tea. Instead, the tea had an identical flavor to a standard straight rooibos tea. 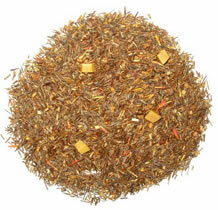 And if you want a straight rooibos tea, you are best off simply ordering one. Brewing Instructions : Use 1 teaspoon of leaves. Pour 6 ounces boiling water over the leaves. Let brew for 5-10 minutes. A brew time of 8 minutes was used for this review, as I prefer a stronger taste.